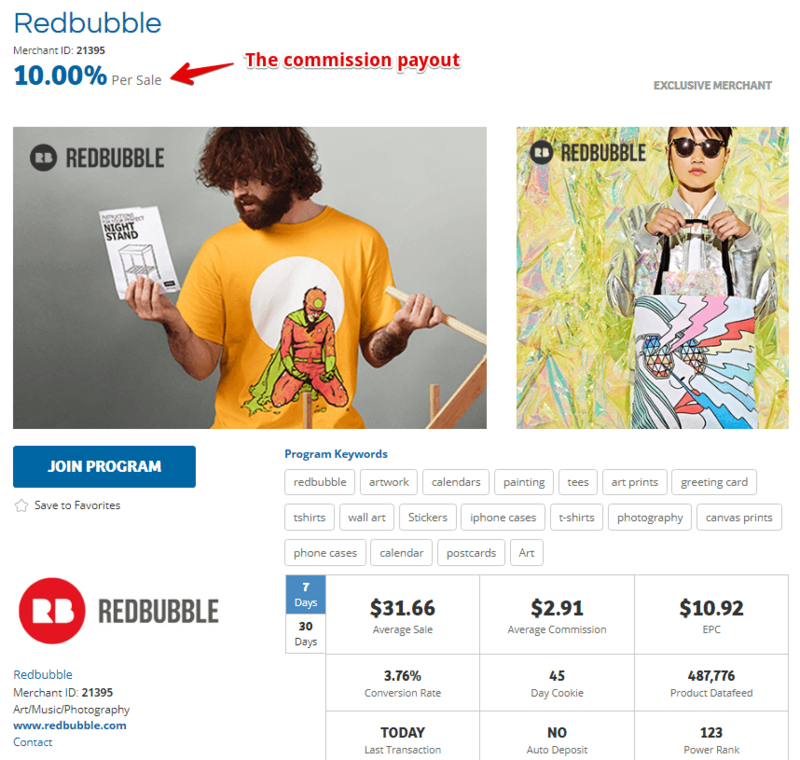 You are here: Home / eCommerce / Can You Make Money on Redbubble? Can You Make Money on Redbubble? Like you, many creative artists who are looking to sell their designs online are familiar with Redbubble. Since 2006, they have been providing good customer service and a wide range of products so people generally use them without actually asking – can one make money on Redbubble? In today’s platform review, I’ll go behind the scene to offer some perspective as to what you really need to make your artist career an online success. Print-on-demand (POD) sites are very popular among consumers because they allow product customization so it feels like you are buying something that is unique in the market. From a seller’s standpoint, this means a single design can be repurposed for different merchandise without having to carry any stock. The platform doesn’t cost anything and you also get to control your portion of revenue from a particular product sale, usually within the range of 10% to 30% of the retail price. Overall, the selling approach is convenient and shouldn’t interfere with your focus on creating great artwork. For those who aren’t much of a designer, they can still make money by referring customers to the marketplace and earn 10% commission within 45 days, for doing so. This is possible by signing up for their affiliate program through the ShareASale network. Apparently, the company has been running the program since 2009 and is currently one the top performing merchants within the network. With over 400K product links, the advantage is yours to promote whatever you like. However, the factor that attracts sellers the most is usually the number of traffic. According to this resource, Redbubble gets about 23 million visitors per month in which one third of the volume comes from the US. Imagine the immense exposure and sales you will receive even for 0.1% of that number. In most cases, people would just dive into the opportunity, but there are exceptions which I will explain shortly. For now, let’s see what the platform has in place to prepare you for selling. At the homepage, go to ‘Sell Your Art’ to create a user account and fill out as much information as you can under ‘Your Profile’ section. The process will also prompt you to complete payment details before you can start to sell. Following that, you just need to upload the designs, select the type of merchandise to be printed on, set the pricing to how much profit you want to earn and publish your work. Essentially, your portfolio page is your storefront. It houses your bio, portfolio and all the links that you want people to follow. It also has a little journal section where you can publish posts relating to your work. Pretty basic stuff, but if you make full use of them, you will increase the chances of being featured on Redbubble’s weekly page as well as on their homepage. With over 600K users and growing, the platform is a very competitive place to get the viewer’s attention. Since anyone can post for free, this has lead to an oversaturation of designs as a result of many sign ups. Unless you get a spot in the featured section OR on the front pages, there’s really no way for visitors to discover your artwork at all. You can strive to be creative, but you can’t control the featured campaign and certainly can’t pay for such a service either. The product quality is beyond your control as well and if so happened that the customers are unhappy with the condition of the items such as usability and printing, they might not order from Redbubble again. This is always a disadvantage situation for creators who rely on merchandise sales to market their artwork. So, what do all these means? The platform has potentials, but marketing tools are limited for sellers. In fact, it’s clearly stated in the help section that “marketing for yourself is the best way to sell your work”. That means, you need to be more proactive in promoting your work so venturing outside of Redbubble is a must. 1 – Social Networks – One of the most common methods that you are probably familiar with already is to promote on social media. These channels are free to use and almost everyone has their own active networks in at least one or two accounts. So far, graphic-centric platforms such as Pinterest and Tumblr are some of the more popular traffic for sellers. Promoting videos on YouTube is also becoming a trend for those who are comfortable in front of the camera. Etsy – Not a POD site. More like a storefront that sells ready-made or customized items. Profit is made based on revenue sharing. 3 – Your Own Website – As mentioned earlier, the profile page provided by Redbubble is not a space where you can do a lot of things. In order to create a brand identity, you need a personal website and that begins with a custom domain. The common ones like .com, .net or .org are usually priced at $15 (or less) and it’s a good investment if you are looking to start an online business. In terms of website building, I would recommend using WordPress because it offers more functionality. For example, you can display your site with different themes, embed an up-to-date version of your portfolio from Redbubble or better yet, create an online store to sell your work digitally or physically. Over at Redbubble, you are encouraged to write journals to showcase your work and that’s actually a good practice. By doing the same thing on a WordPress blog, however your posts will have better chances of being discovered by the search engines. That means, you can leverage from targeted search queries to attract buyers globally or even locally. Knowing the right keywords to use is a very powerful information because they can show exactly what people are interested in buying in terms of designs or seasons. By optimizing for these keywords, your site could rank higher on Google and drive more eyeballs to check out your artwork. WordPress is actually very easy to set up. If you’ve not tried it before, here’s your chance to create a FREE blog. Simply enter a domain name below and give it a test run. 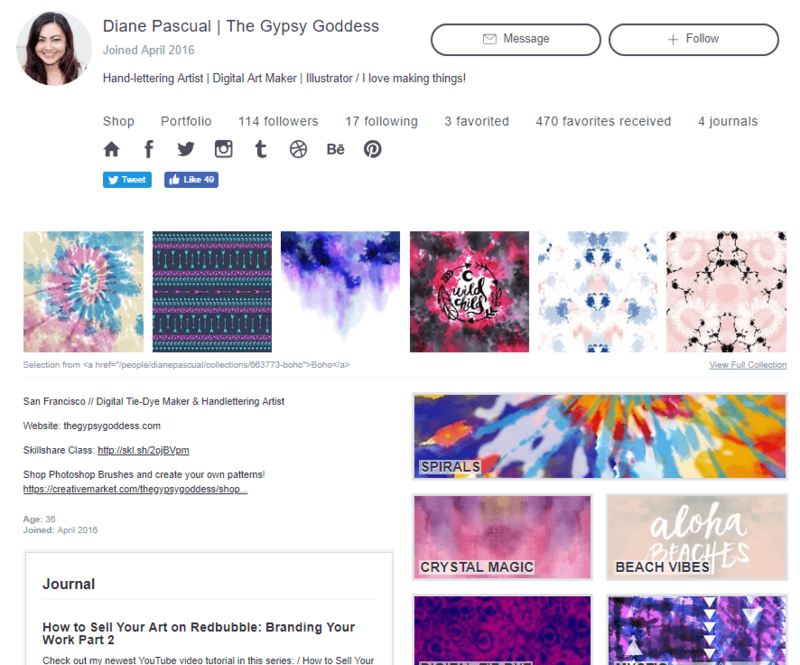 Through continuous promotional efforts outside of Redbubble, you’ll be seen more as a creative individual versus just-another-seller-on-a-crowded-marketplace. Your work will become more noticeable and draw interest from a wider audience. The sum of all these can lead to more engagement and potentially more sales opportunities. So, Can You Make Money on Redbubble? Yes, you can certainly earn profits from what the platform has to offer in terms of products and audience size, but it’s not something that can be achieved in a short period of time. As I clearly pointed out, it takes much more than just publishing your designs to generate a substantial amount of income. There’s much to be capitalized on this artist revolution and in a competitive online space, thinking outside of the box can either make or break your artist career. Sometimes, the lack of sales is not necessarily a reflection of your work not being good enough, but that your effort in marketing is inadequate. So that’s something to really think about. If you like to learn more about building a successful business online, come and check out the benefits of my recommended training platform. It’s a great tool for affiliate marketers and new business owners like you. Question – Have you had any experience selling or buying on places like Redbubble? We would like to hear about your comment below. Hi Cathy – on the face of it, Redbubble seems like a great idea – and it is! – but it doesn’t sound easy to make it as a creative. You may do better promoting the platform itself as an affiliate! For creatives, part o the problem is that if there is no gatekeeper, there is no quality control. The same thing happened when Amazon allowed anyone to publish their own book. Hooray – no more being held back by ‘short-sighted’ publishers – but the lack of quality control – traditionally a publisher – meant that 99% of self-published books (I kid you not) are garbage! As for Redbubble, the customer can see the quality of the design, but not the merchandise so perhaps Redbubble has the edge here. Yet, as pointed out, the most important aspect is getting your designs seen in the first place. These artists will also need to promote heavily on other print-on-demand sites to get noticed. It’s interesting that you get into some of the mechanics of producing your own website. The fact is, today, you must be intensely self-promoting in order to be seen, and anyone who wants to sell anything to the public must be very aware of this. I have long since relegated my creative urges to the back-boiler and find it far more profitable – and (almost) just as creative – to concentrate on blogging and internet marketing. To re-quote the famous Thomas Edison – Success (genius) is 1% inspiration, 9% perspiration and 90% marketing – I think the key to selling on Redbubble resonates just that. Like some of your other readers I was a little taken aback that I’ve never heard of Redbubble. I have no doubt after seeing the stats that you wrote that I have HAD to be on RedBubble at some point. My life is full of artists so I’d be shocked if I wasn’t. Etsy was my go-to for years but, when they began allowing non-original artwork to be sold, I lost interest quickly. In my thinking an original artist truly needs a website these days if they want to share their work with the world. Maybe I’m just a fan girl, but my artist friends have a ton of stories that pertain to their artwork. I’d love to see more people sharing deeper stories about that on their personal blog. Any stories from comical to gut-wrenching can really add new textures to art work that will capture potential buyers for the long term. My wife writes poetry so I am wondering is there’s an opportunity on this platform for her to sell some of her work. It would be an interesting idea, but I am not sure if someone would want something written to be printed or not. I’ll have to check out. Hi Andy, you could try greeting cards, stickers or wall art. I think snippets of poetry can make good gifts for special occasions. The company does the printing and shipping work so that’s one less fulfillment area that you need to worry about. I have a friend who is a professional designer so I think she’ll be interested in exploring this art platform. Honestly, I don’t know about Redbubble until I read this review and I think, it is a good opportunity for creative people to earn some extra cash on the side with their skills. Even though competition is big – most niches are anyway – we should not give up that easily. It seems to me that you really have to know what you’re doing to really make sales on Redbubble. You have to be an expert in online promoting more than just being an artist. This gives me the feeling that some of the best artists never get the exposure then deserve, because they’re not skilled in marketing their brand. Becoming an expert in any niche nowadays will require one to learn marketing as well because no one knows about your stuff better than yourself. It’s time creative people move away from the conventional mindset to an entrepreneurial one, which gives them more authority to take charge of their career, especially in the online space. And I think that by mastering online marketing tools, techniques and approaches, this will have a long-term benefit for the artist’s ability to get recognized and to have a chance at making a living selling his or her art on platforms like RedBubble. It can be a formidable one-two punch. Wow! Can you believe I never even heard of Redbubble? That’s what is so crazy about the Internet and affiliate marketing in general. Right when you think you have it figured out, you find an article like this and you realize that 600,000 users have the leg up on you. Interesting how one can make money on sites like this, or even better, on their own site. Hi Cathy, I have heard of Etsy for selling crafts, Redbubble is new to me. Perhaps because I live in Europe? They get an awful lot of visitors, about 23 million a month! At least worth to check it out when you have art to sell. A friend of me has chosen to sell his art on his own website and then, share his work on social media. I don’t know what would work better. If people have tried Redbubble and it didn’t work out, perhaps creating a website is something they could do? Hi Loes, creating an art-based website is doable and it will serve like an online gallery or portfolio for introducing their work. Some people turn it into an online store, but more commonly, they would redirect users to marketplaces that they use, for checkout. It’s quite common for artists to list on several places so that they can increase their exposure and convert to more sales.